← Allure of the Ancients: The Collected Edition! 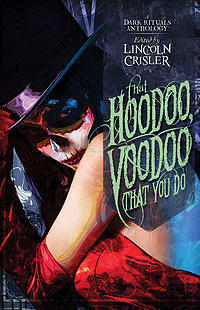 The Angelic Knight Press/Ragnarok Publications anthology, That Hoodoo, Voodoo That You Do, has been released today and includes my tale, “Wounds”. The anthology was edited by Lincoln Crisler and contains 22 stories all exploring the theme of dark rituals. The splendid cover art illustrates it perfectly, don’t you think? Robert entered an empty interview room and sat down with the case file. Dante was at the gates and it was time to open them. Robert peeled back the cover and skipped the introductory report. He already knew there were two victims; what he had to read now was the finer details: the post-mortem report, the list of suspects, and of course, the crime scene photos. As he turned the pages, he turned the pages of his memory; sheaves of pain rolled over and crashed down like waves. He squeezed his eyes shut, eager not to let the past slice into his head. But this is the price Dante had to pay every time he abandoned all hope. The killer had abducted his victims, stripped them naked and opened their torsos with a broad, arched blade. The wounds were scattered evenly over the torso, arms and legs in sets of seven. In Numerology, 7 is the thinker, the seeker of truth. Seven times seven, times seven. It was clear this killer was seeking some hidden truth, just like Sickle. And just like Sickle, this killer had disposed of his victims by displaying them inside abandoned buildings throughout the city. A twinge of pain flowed down his right side. He pressed his hand to his abdomen, desperate to stifle it, but the pain was back now, as fresh as it ever was. If someone was copycatting the Sickle Killer then there would be five more victims. The magical number seven. A ritual of madness. There was a knock at the door, wrenching Robert away from the pages of the case file. He turned and found Van Nouten looking at him with a pitying stare. If you liked that you can pick up a copy of the digital version of the anthology via this LINK. The paperback version is expected to be released soon. This entry was posted in Uncategorized and tagged Angelic Knight Press, anthology, lincoln crisler, That Hoodoo, Voodoo That You Do. Bookmark the permalink. And I started reading this amazing book today. Love, love, love it.